So, now that our first half of our school year is over, I can take a deep breath and look back on what we’ve done so far. As a new homeschooler, I can see that I’ve had to adjust some of my expectations. The year started off strong, but then, as we got into our year, the boys have struggled with some things, and so have I. I’ve realized that I need to relax and enjoy my time with my children more. What is the point of homeschooling if I spend most of my day fighting with my kids? I wanted to do this so I would have time with them…happy time…time to just enjoy being together. I question if I am pushing them too much…am I not structured enough? do I need to just scrap it all and go back to the drawing board? So what do I do? 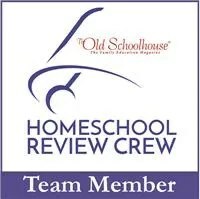 I am fortunate to belong to a homeschooling group with moms much more experienced in homeschooling than I am. I’ve been able to talk with them about my frustrations, and have enjoyed getting their perspective on the situation. In addition, I’ve gotten inspiration from reading blogs about homeschooling, (again, from experienced homeschool moms), in particular, Heart of Wisdom http://heartofwisdom.com/blog/ and Anne Elliot’s blog http://anneelliott.com/blog/my-discussions/. I’ve decided to make a few changes, going with more of a delight directed approach in history and science, and really focusing on our bible study. After all, the main reason my husband and I wanted to homeschool our children is to be able to raise Godly men, how can I do this if I don’t put God first in my homeschooling? I’ve also spent a lot of time in prayer, and I am focusing on handing over my homeschooling to God EACH AND EVERY DAY. I know that He has goals He wants me to accomplish with my children. And if I will only submit to following His guidance, He will lead me in the way I need to go. That’s the goal for this new year for me: To take each day and live it to the fullest for God, in homeschool and in life in general. If I can teach my children to live each day for the Lord, than I will consider our homeschool successful! I am looking forward to our two week break for Christmas, and I hope to come back in January with a renewed spirit, ready to enjoy the rest of the school year with my boys! Both of my children (and I) have very fond memories of watching the Tiny Planets TV show on PBS when they were younger. So, when I was given the chance to review their website, I was really excited. The moment I went to the site, and the theme song started playing, both boys poked their head in the computer room and said, “Hey, I remember that!” The site focuses on using games, books and other fun activities to teach kids about taking care of the Earth. The site does include videos of the TV show, which is the first thing my kids checked out. I have to admit, I sat there and watched a few episodes of Bing and Bong’s adventures myself. The show is a really sweet, funny show, and the alien characters are ones my kids identify with. Bing almost seems like the older brother, taking care of Bong as he explores. The aliens themselves communicate through sounds (i.e. like Wall-E), but the narrator helps describe what is going on. My Tiny Planets is a virtual world, where your child can create an avatar and adopt and care for their own planet. They also get to go on “missions” with Bing and Bong, fly spacecraft, care for plants in a biodome, and do other fun stuff. This is an online community where students can make “friends” and visit. However, there is no free form chatting, and children must choose a name for their cadet from a list of suggestions, so personal information is never used! The site also has interactive books that feature Bing and Bong, which your child can read on their own or with you. My younger son really enjoyed this part of the website, and I would hear him in the computer room laughing as he read along! Tiny Planets Labs includes additional games your child can play, that have been devoloped alongside EU university. My sons enjoyed the Lava game as well as quite a few of the others, and this portion of the site has new offerings on a regular basis. Tiny Planets also includes resources for parents with lesson plans with activities, puzzles, experiments etc. that you can do at home! 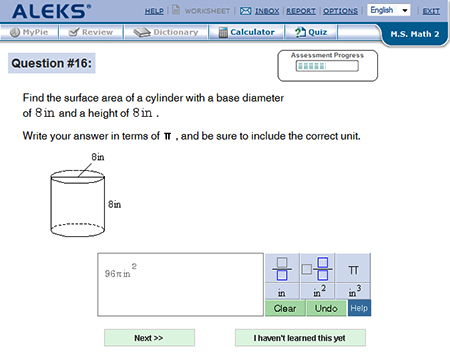 For my latest review, I was given an opportunity to have my children use the ALEKS math program. 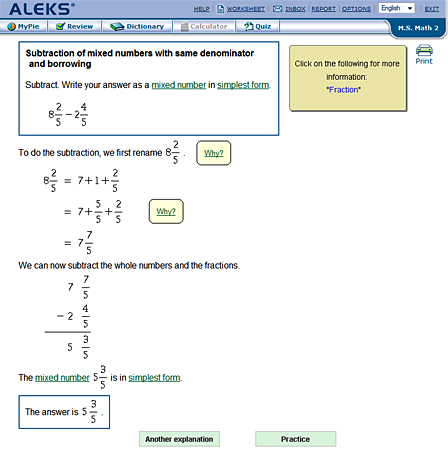 ALEKS is an acronym for Assessment and Learning in Knowledge Spaces, and it is a web-based program that offers practice in math facts (i.e. addition/multiplication etc.) as well as full math courses for grades 3-12. Our experience with ALEKS was VERY good. Signing my children up was easy, as was managing their activities through the parent account page. I was able to assign quizzes, receive scores, adjust time on the Quicktables (more on that later) as well as email my “students” 🙂 My older son really enjoyed sending me an email everyday! Once you chose a level for your child, they are given an assessment to determine what they already know. From there, they are given a pie chart that includes the different areas of mathematics (algebra, geometry, decimals etc.). 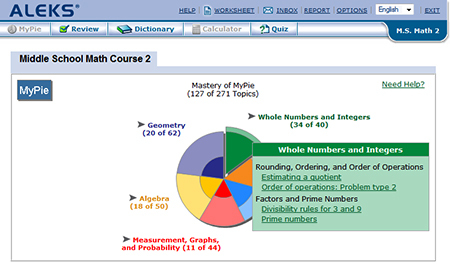 Children are able to click on the pie chart and choose a topic to work on. For example, my older son really needed to get some work in on algebra and geometry, so I told him to focus on those areas. Each day, I had him complete 3 or 4 lessons on something within those topics. Each day, he would log on, and choose something to work on (i.e. “area of a paralellogram”). He would attempt a problem, and if he didn’t get it, he could click on the “explanation”. This took him to a page that gave him a detailed explanation of how to solve the problem. He would then be given additional problems on that topic until he had “mastered” it. The explanations are in written form (as opposed to video), so if your child has difficulty getting something just by reading it, you may need to be in the room to go over that part with him/her. However, the explanations do include a lot of visuals, and actually solve the problems step-by-step, so I found that my son did not need a lot of help from me! Each week, I scheduled a “quiz” for my son based on the problems he had worked that week. 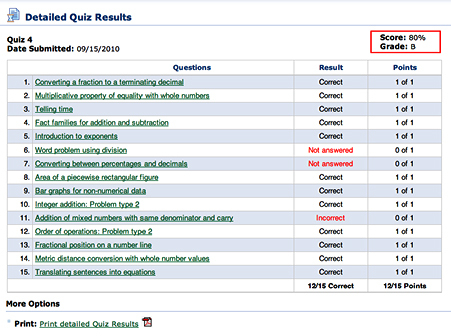 After the quiz is finished, students are able to review the problems they got wrong. I thought this was VERY helpful because my son was able to see his errors, and recognize whether he messed up on a simple calculation, or if he was doing the problem wrong. ALEKS also sends an email to the parents each week, letting you know about your child’s progress. The details of their reports was very impressive! They list what your child already knows how to do, what they need to work on, and how far they have gotten. Like I said, he is currently at 76% mastery of his multiplication facts since we started using ALEKS about 4 weeks ago, so to me, this program has been a HUGE help! ALEKS costs $19.95 PER student PER month, or you can pay $99.95 every 6 months, or $179.95 for one year. They do have a family discount rate for homeschoolers, that allows you to pay less for each child you enroll. This may seem costly, and honestly, this year, it may have been outside of my reach, but I think I would pay month to month if I needed to, to allow my kids to access parts of this program. You could definitely use it in conjunction with, or as a supplement to, a program you are already using (which is what I did). The people at ALEKS have also given us a chance to share a 1-month free trial to new users! Click on the ALEKS button under the Blog Cruise picture on the right of my blog to access it! 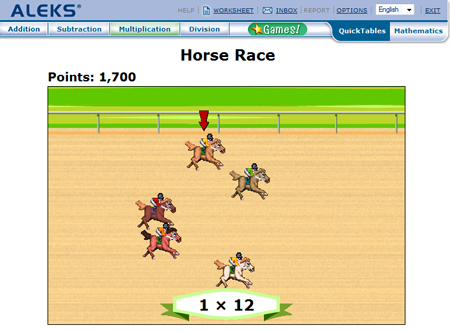 Overall, I thought this was a great math program, and my kids really enjoyed it! 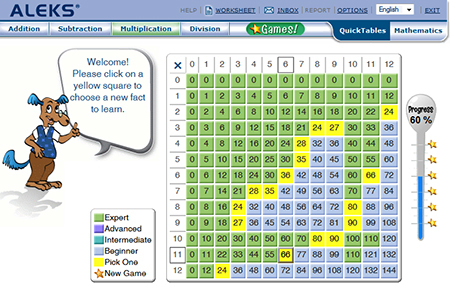 First, the flip books are three spiral bound books that actually “show” different equivalent fractions to your child. With these books, kids can “see” how 1/3 and 1/6 are related, they simply flip the page from the “thirds” to the “sixths”. This made fractions very easy to understand for my concrete-loving boy. Fractions are also divided from fifths to twentieths, and halves to sixteenths. The workbook contains lots of practice in dividing fractions and covers everything from practice with comparing fractions to equivalent fractions and mixed numbers. Using the flip books made this very easy for my son to understand. There was just something about being able to “see” how the fractions work that made it really click with him! The cost of this particular program will vary, depending on what you want to buy, but the base price for the flip books is $17.95, with the workbook costing an additional $15.95. If you have a child (like mine) who really needs to “see” something in order to get it, this is well worth the cost!